The Partnership, adopted in the list of the World Summit on Sustainable Development (WSSD) as a Type II initiative – an informal and voluntary initiative, was launched on 6 November 2006, and aims to protect migratory waterbirds, their habitat and the livelihoods of people dependent upon them. Partners include governments, inter-governmental agencies international non-government organisations and international business sector. 2002 The East Asian-Australasian Flyway Partnership (EAAFP) was adopted in the list of the World Summit on Sustainable Development (WSSD) as a Type II initiative. 2009 May – The five year Memorandum of Understanding (MOU) on hosting the Secretariat of the EAAFP was signed by the Chair of the EAAFP, the Ministry of Environment of the Republic of Korea and the Metropolitan City of Incheon. Migratory waterbirds and their habitats in the East Asian – Australasian Flyway are recognised and conserved for the benefit of people and biodiversity. The Partnership provides a flyway wide framework to promote dialogue, cooperation and collaboration between a range of stakeholders to conserve migratory waterbirds and their habitats. Stakeholders include all levels of governments, site managers, multilateral environment agreements, technical institutions, UN agencies, development agencies, industrial and private sector, academe, non-government organisations, community groups and local people. Provide a platform for international cooperation for the conservation of migratory waterbirds and the sustainable use of their wetland habitats. Support the development of a Flyway Site Network, to ensure a chain of internationally important wetland sites are recognized and sustainably managed into the future. Support a range of activities to increase knowledge and raise awareness of migratory waterbirds, while building capacity for the sustainable management and conservation of migratory waterbird habitats along the flyway. Partners – meet regularly to report against an Implementation Strategy, respond to emerging issues and priorities and discuss future collaboration. Working Groups exist for Shorebirds, Anatidae, Cranes, Seabirds, Avian Influenza, Black-faced Spoonbill and CEPA. These groups liaise out of session and report against their Terms of Reference at partnership meetings. View contact details of the Working Groups. Task Forces exist for Monitoring of waterbird populations and sites, Coordination of colour marking, Yellow Sea Ecoregion, Amur-Heilong Basin, Review of Network site criteria and population estimates, Spoon-billed Sandpiper and Scaly-sided Merganser. These task forces liaise out of session and report against their Terms of Reference at partnership meetings. View contact details of the Task Forces. The Chair rotates among partners biennially. China is the current Chair and USA is the current Vice-Chair. The Secretariat is located in Republic of Korea. View contact details of the Secretariat. The partnership is open to new partners. Governments, international NGOs, inter-governmental agencies and international business sectors interested in joining should contact the Secretariat. Access the Become a Partner page for more information on the procedures for membership and the benefits of joining. The EAAFP Secretariat is hosted by the Republic of Korea and Incheon Metropolitan City. 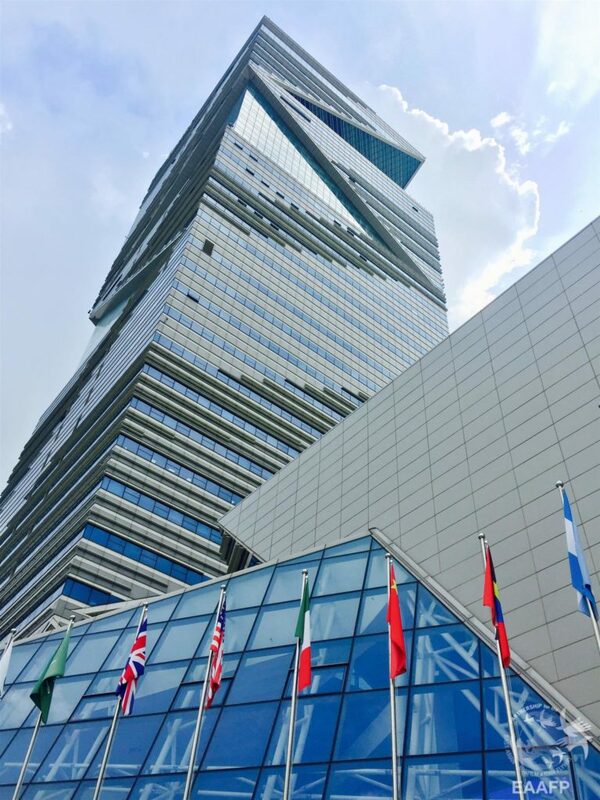 It is headquartered in the Songdo International Business District of Incheon City. The Secretariat is a small professional team of six staff and various personnel taking the role of either consultant, volunteer, or intern. 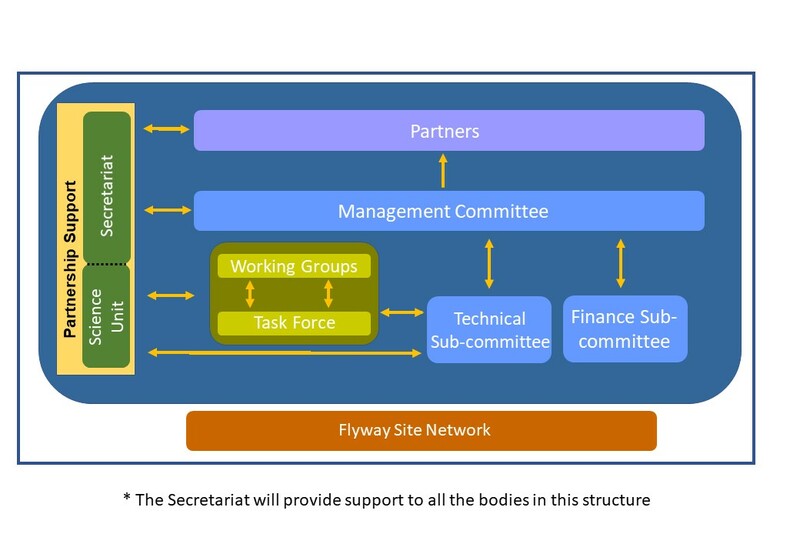 It serves the Partnership mainly by performing administrative functions, however, the Secretariat may also provide some coordinating services or give technical support to some project activities, at the international (Flyway) level, as a component of its work. For contact information of Secretariat staff members, please access the Secretariat's contact page. Career and internship opportunities at the Secretariat can be found here. By definition, a secretariat is the officials, or office, entrusted with administrative duties, maintaining records, and overseeing or performing the secretarial duties, especially of an international organisation (Dictionary.com). It is not necessarily like a government department that may have obligations to provide community services, or like a private company that undertakes projects to make a profit, or like an NGO that may frequently undertake projects without making profit. The Secretariat of the EAAF Partnership is a small professional team (presently, 5 staff) that serves the Partnership (35 Partners so far). It is most like a typical secretariat: it performs many administrative functions. However, it may provide some coordinating services or give technical support to some project activities, at the international (Flyway) level, as a component of its work. Does the EAAFP engage at the national level? The EAAF Partnership primarily exists to promote and support international cooperation and this means that most of its work will be at the international, not national (domestic) level. If all conservation activity on waterbirds needed to occur only at the national level, then there would be no need for international cooperation and thus probably no need for the Partnership. Furthermore, in joining the Partnership, the individual Partners commit to meeting the objectives listed in the EAAFP Partnership Document. The Government Partners have territorial jurisdiction, so they can do this at the domestic level. Non-government Partners commonly also operate in-country. In contrast, it is not the role of the Secretariat to work substantially at the national level in each Flyway country, because it has neither the mandate nor the means to do that. Nevertheless, where appropriate, the Secretariat of the EAAFP will support the Partners in their domestic activities. Examples include: advising Government Partners on nominations to the Flyway Site Network; encouragement to develop national partnerships (domestic networks) for conservation of migratory waterbirds; and promotion of demonstration projects that clearly have Flyway-wide benefits for conservation of migratory waterbirds. Why is the EAAFP not part of the United Nations? In agreeing to form the EAAF Partnership in 2006, the founding Partners, with endorsement of subsequent additional Partners, chose to establish an informal non-binding mechanism for cooperation. This type of Partnership is recognised by the World Summit on Sustainable Development. It does not require annual membership dues (fees) from each Partner. The EAAF Partnership therefore differs from some other partnerships including the legally-binding mechanisms that are within the framework of the United Nations. There are several reasons for this approach. Firstly, the Partners wanted to encourage participation in the EAAFP by as many Flyway countries as possible. A legal obligation and annual payment, on top of payments already required due to membership of other agreements, might discourage some countries from joining. Also, whereas the Africa-Europe Waterbird Agreement is affiliated with UNEP because many countries were Parties to the Convention on Migratory Species (CMS), the proportion of countries that are CMS Parties in the EAA Flyway is low, therefore that approach was not possible in our Flyway. Is the EAAFP a funding body? No, the EAAF Partnership does not exist to disperse money from a core fund to worthy proponents of worthy projects for waterbird conservation. It does not collect membership dues from its Partners (members) and does not possess unrestricted core funds, though from time to time it may provide technical advice to Partners in regard to their own funding proposals, or support a group of Partners in bidding for funds to conduct a Flyway-wide activity on migratory waterbirds. Presently, the Secretariat has an annual budget allocation for Partnership Activities but these funds are typically consumed in running predetermined activities that bring numbers of Partners together to work collaboratively on priority tasks. Partners and entities with an interest in conservation of migratory waterbirds may apply to small grant funds or major regional or global donors to environmental projects. Does the EAAFP lobby countries or corporations that are considered to be destroying waterbirds or their habitats? The protection of migratory waterbirds and their habitats is a broad goal of the EAAF Partnership. Cases involving habitat destruction arise in most countries and demand a general response. Many organisations, local and international, are involved in and experienced with lobbying or advocacy work and can respond to such cases using their skills and preferred approach. But the EAAF Partnership includes Government Partners and therefore does not directly interfere with the sovereign rights of those Partners. Presently, the EAAFP is developing a policy on how – at the international level – it should simultaneously address imminent habitat loss, the associated political sensitivities and the maintenance of Partnership coherence. Meanwhile, external parties may take up matters of concern directly with the relevant Partner Government or by seeking intervention by an EAAFP Partner or by a group of Partners. Does the EAAFP emphasise certain regions of the Flyway? The EAAF Partnership aims to work across the entire EAA Flyway; this is a huge part of the globe involving 22 countries. At a particular point in time it may be involved in activities of international cooperation in certain regions (parts) of the Flyway, according to need and opportunity. But over the long term there is no intention to focus on one or more regions to the exclusion of other regions of the Flyway.